Gosselies, Belgium – April 17, 2018: OncoDNA ("OncoDNA or "the Company"), the healthcare technology company that collates and translates complex cancer biomarker data to make precision medicine a reality, is pleased to announce the publication of a study in the journal Oncotarget evaluating the utility of OncoDNA's comprehensive biomarker analysis and interpretation services in clinical settings. The study, published online today and titled "The clinical impact of using complex molecular profiling strategies in routine oncology practice", found that combining advanced, comprehensive testing of cancer biomarkers with OncoDNA's proprietary cancer treatment knowledge database can enable oncologists to make better treatment decisions for their patients. This is because OncoDNA's testing combines immunohistochemistry, next generation sequencing (NGS), and other tests including inherited heart condition testing, DNA methylation, and microsatellite instability (MSI) testing, rather than the industry standard of NGS testing alone. The study analysed samples from 1,057 late-stage and advanced grade cancer patients from over 30 different countries on four continents between January 2015 and January 2016 for whom at least one standard of care treatment had already failed. Samples were analysed either by the sequencing of a solid biopsy only – with either a hotspot panel or comprehensive panel including more than 400 genes – or the study of biomarkers determined by immunohistochemistry and other biomolecular tests, or a combination of both. 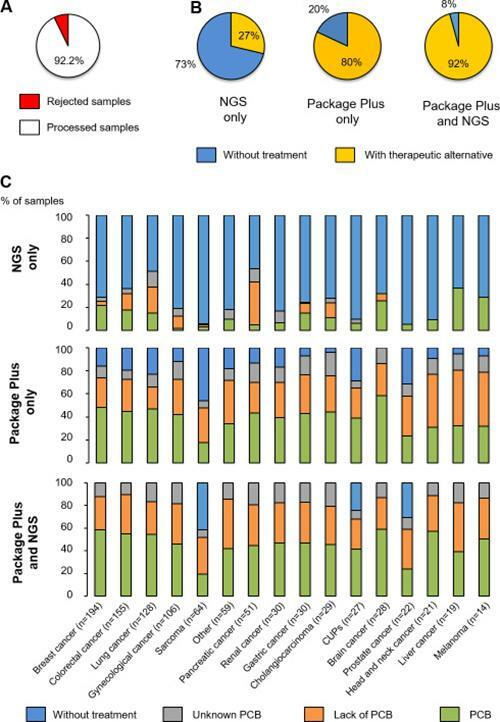 In order to assess the utility of tumour profiling in clinical practice, the study also analysed the therapeutic decisions made by oncologists after receiving OncoDNA's tumour analysis and treatment recommendation. Overall, OncoDNA's treatment recommendation was followed in 60.4% of cases and in 99% of the cases that did not follow the recommendation the cited reason was drug unavailability or cost, not clinical consideration. The vast majority of treatment decisions (93.4%) were made based on OncoDNA's combination of tests rather than NGS alone. This is a substantial increase on NGS testing alone, which will typically yield a treatment recommendation in only 30% of cases. For the cases in which OncoDNA's treatment recommendation was followed, 27% of patients had an overall survival of >12 months, a significant improvement for late-stage patients, who normally have a life expectancy of no more than six months. Jean-Pol Detiffe, Chief Executive Officer of OncoDNA, said: "This dataset demonstrates the utility and power of OncoDNA's proprietary, living database and our holistic approach to genomic and molecular profiling. For oncologists, the study suggests our testing and analysis products could represent the best way to make informed therapeutic decisions in clinical practice. Not only were OncoDNA's recommendations followed in the majority of cases, but the study also suggests that our comprehensive testing and analyses could represent the best approach for obtaining useful molecular insight, while reducing physicians' exposure to irrelevant aberrations. As we continue to expand our business through Europe and beyond, these results will help raise awareness of the benefits of our product offering among oncologists and further the healthcare industry's ability to prescribe precision medicine." OncoDNA is a private, oncology-focused healthcare technology company that combines advanced, comprehensive testing of all clinically relevant cancer biomarkers (DNA, RNA and protein profiles) from both solid and liquid biopsies with a proprietary cancer treatment knowledge database called OncoKDM™ that continuously 'learns' from cutting-edge, validated, scientific and medical advances. This one-stop-shop analysis and interpretation service gives oncologists actionable results to enable the selection of treatments tailored to an individual patient's cancer profile. OncoDNA also works in collaboration with the biopharma industry to develop and deliver the treatments of tomorrow by assisting with design, enrolment and assessment of clinical trials as well as increasing access to approved precision medicines. The company is based in Gosselies, Belgium, and employs c. 55 employees in four countries.